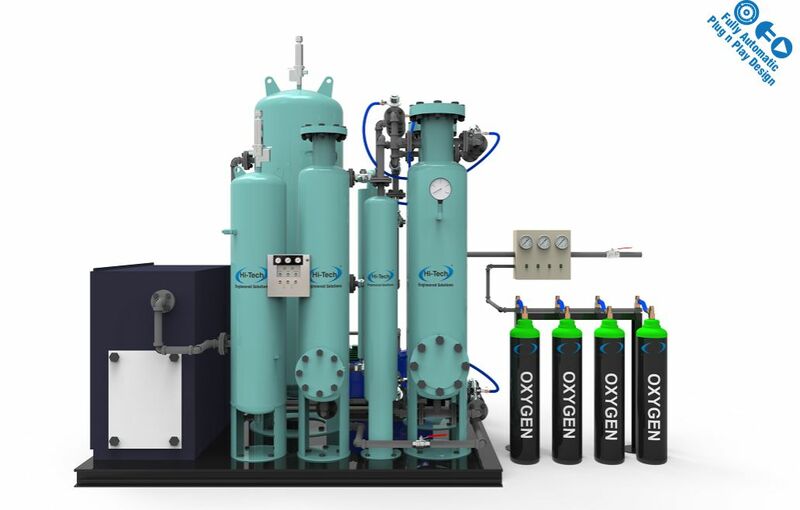 The Hi-Tech’s Medical oxygen Plant allows users to generate their own oxygen for their medical-grade requirements like EMS (Emergency Medical Services), Ambulance, Fire Departments, Small Hospitals, Clinics, Nursing Homes, Veterinary & Animal Hospitals, Dental labs and SCUBA applications. The plant has inbuilt oxygen cylinder filling plant that uses Pressure Swing Adsorption (PSA) technology. Plant is mounted over platform and acquires less space, only a simple mounting of plant, and plugging it in to a standard electrical outlet, you can generate your own medical-grade oxygen to fill your own cylinders on-site. Within minutes, you can have emergency oxygen available for any increase in unexpected demand. Never run out of oxygen ever again! The plants may be small, but don’t let the little size fool you! The Plants contains a rich history of using the highest level of manufacturing engineering expertise in its design. Theplants are self-contained and operates very quietly. These quality components all work together to regulate the flow of oxygen cleanly and safely throughout operation. Plants are designed to run automatically and requires little or no maintenance once it is up and running. With a digital color touch screen display, the unit shows all the information required to monitor the manufacturing process of oxygen. system performs a continuous series of self-diagnostic tests as it runs. Should an issue arise such as drop in oxygen purity; the plant will automatically shut down and display a visual alarm on screen. There is an optional audible alarm available as well. This is one purchase you make that can truly pay for itself! The plants are economically priced so that you can realize a fast payback usually within a year or two. You can fill an H size (6M3 size) cylinder for 6 KWH cost. These plants are designed to be shipped in standard 20 or 40-foot ocean containers for worldwide transit. On-site commissioning & training is available from our Technician. Electrical power and an enclosure for the plant are all that is required at the customer’s site to get started. Hi-Tech’s Oxygen Generators Can be operated and maintained without extensive technical knowledge or training. our easy to follow manuals, videos and on-site training will enable your staff to properly calibrate and maintain the whole system. Routine maintenance is limited to normal air compressor upkeep and periodic cleaning and replacement of filter elements only. USP requirements- ‘Oxygen 93 Percent’ contains not less than 90% or not more than 96% by volume, of Oxygen, the remainder consisting mostly of argon and nitrogen. Meets the requirement of identification, Odor, CO2 not more than 0.03%, and CO not more than 0.001% in gas. Hi-Tech’s Oxygen Generator System is fabricated in accordance with all relevant codes Like ASME, ANSI, NEMA, CE Standards, Medical Oxygen Generators are built to confirms to the United States Pharmacopeia (USP) Oxygen 93% Monograph and also confirms to ISO-10083. The PSA system provides highest reliability the control system allows for the production of nitrogen gas at the specified flow & purity within short time of demand using a simple push button.this on/off operating capability is not available from cryogenic plants. The plant is automatically adjusted to the actual product flow requirement and operates in an energy saving partial load mode. Lower energy consumption than crygenic units. PLC based control system controls the purity and the flow by automatically adjusting the cycle time of the PSA system. A Profinet or LAN port is provided for the communication with complete Plant DCS with a optional Modern Boradfor Remote Control. Our Generators Provides from 12 to 1,415 LPM of oxygen. Use the following Table to determine which model is most suitable to your application.